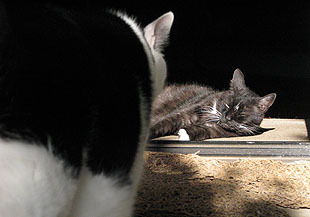 Domino was sunning herself in the doorway yesterday — it’s been in the high 80s all week here — and I happened to have the camera out when Inkblot decided he wanted to go inside. What a hulking presence! Domino is obviously not excited by the idea of letting him by, but as it turned out, all went smoothly. 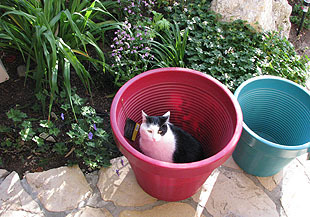 Over on the right, however, we see how to make Inkblot look positively puny: just put him inside a gigantic garden pot. Perspective is everything. Need more cats? Check out Slate’s “The Cats of War.” Good stuff.